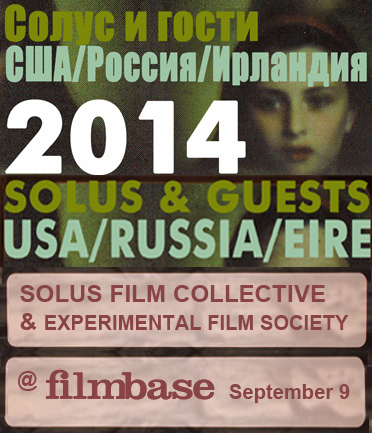 Third and final stop: Tuesday September 9th, 6.30pm, €7, Filmbase, Curved Street, Temple Bar, Dublin. Masha Godovannaya is a filmmaker and visual artist, born in Moscow, Russia, in 1976. Masha studied music, literature and book publishing before leaving for the United States where she received her BA in Film Production from Brooklyn College CUNY, in 1998. In New York Masha joined the Mecca of experimental cinema, Anthology Film Archives. During several years, she devoted herself to programming film series in various cultural institutions and festivals, and in the meantime worked on her own movies. After living in New York for seven years, she returned to St. Petersburg, Russia, in 2003 where she continues pursuing her artistic career as a film/video curator and visual artist and teaches film/video classes at the Faculty of Liberal Arts and Sciences (Smolny College) of St. Petersburg State University. She completed her MFA degree in Film/Video at Bard College, New York in 2012 and now working on her MA degree in gender studies at the Faculty of Political Science and Sociology at European University of St. Petersburg. Masha’s films and visual works have been shown at many international film festivals, screenings, galleries and biennials such as 7th Liverpool Biennial (UK), Center Georges Pompidou (France), Rotterdam Film Festival (the Netherlands), Oberhausen International Film Festival (Germany), London Film Festival (UK) and others; her curatorial projects have been presented at different venues such as Loft Project Etagi (Russia), Anthology Film Archives (USA), Independent Film Show (Italy), Moscow International Film Festival (USA), Avanto Film Festival (Finland) and others. Filmbase, Curved Street, Temple Bar, Dublin. For this final installment we will be presenting the premiere of Masha Godovannaya's film 'Objects In Mirror Are Closer Than They Appear'. Masha co-curated the second installment of the tour, which screened in the Etaghi Gallery in Saint Petersburg earlier this summer. She has been a long time Solus collaborator and her work also featured in the first tour installment, the program curated by Moira Tierney for the New Orleans screening.